Searching for a festive red potato recipe for Thanksgiving? These Potato Boats are as fun to make as they are to eat. This Thanksgiving side dish recipe calls for red potatoes, butter, sour cream and herbs. Create a sail worthy of the Mayflower with toothpicks and zucchini and carrot strips. 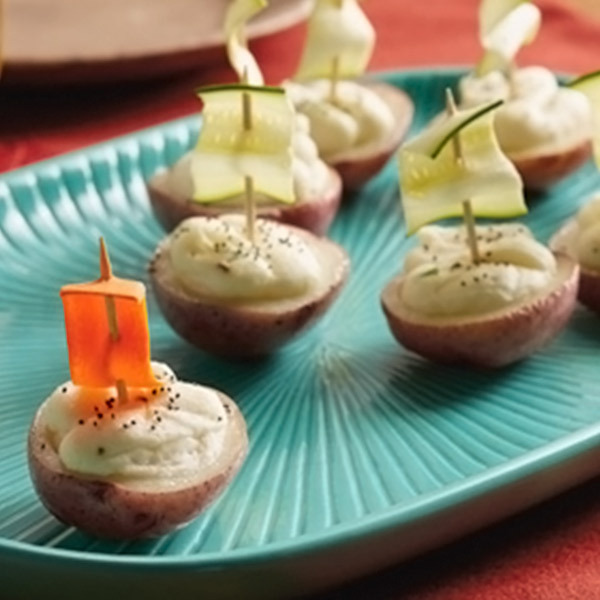 Don't be surprised when these tasty Potato Boats leave mashed potatoes in their wake! Preheat oven to 350°F. Place sliced potato halves in a bowl and toss with olive oil. Transfer potatoes to a baking sheet and turn them cut-side down. Bake until potatoes are fork tender, about 20 to 25 minutes. Remove baking sheet from oven and allow potatoes to cool slightly. While potatoes are still warm, scoop out the center section using a melon baller or small spoon. Leave about ¼ to ⅛ inch around outside edge of potato. Place all potato centers in a medium mixing bowl with butter, and mash together until butter is completely melted. Mix in sour cream and herbs until smooth. Season to taste with salt and pepper. Scoop spoonfuls of potato mixture back into boat shells with a spoon. Use toothpicks to skewer through the top and bottom of the zucchini and carrot strips to form the sails. Insert a toothpick sail into each potato half. Sprinkle tops with poppy seeds. Serve potato boats warm or at room temperature.